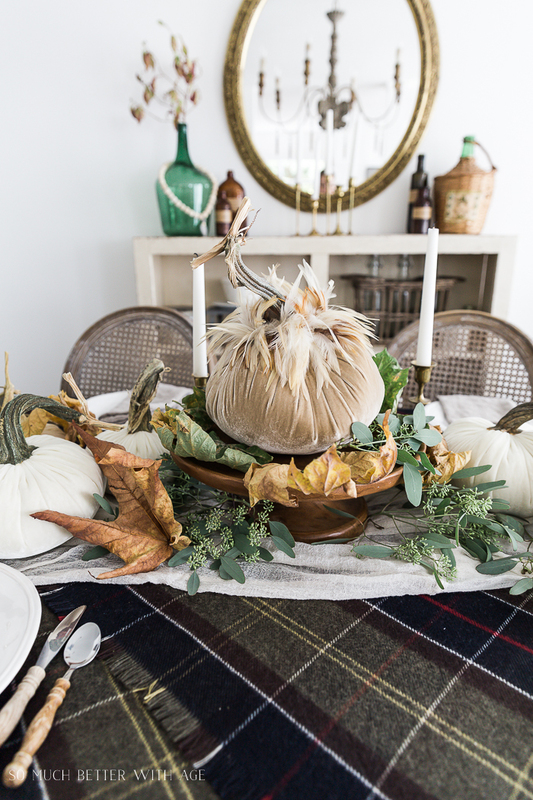 This velvet pumpkin centrepiece is the perfect way to add elegance to your table this season. I’m totally a fan of velvet pumpkins now! Have you seen them before? 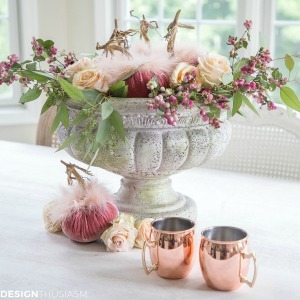 They add such a beautiful luxury to any fall table setting. 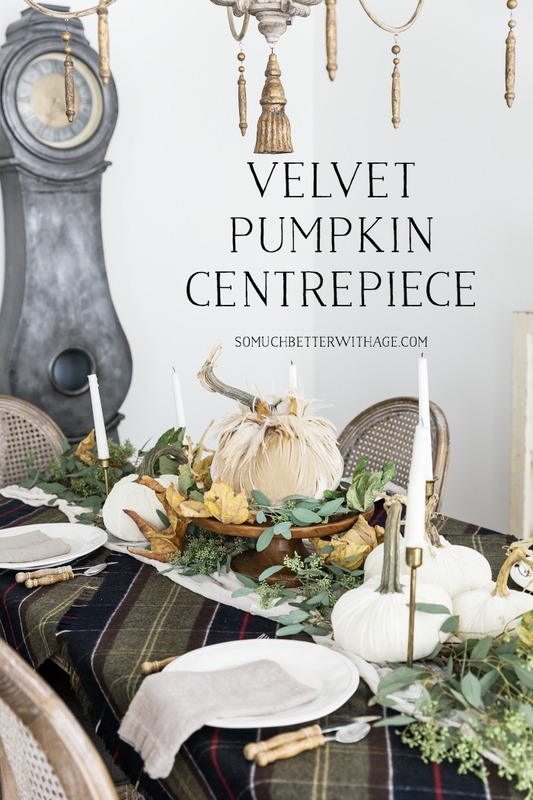 Today I’m joining my talented friends to share our Velvet Pumpkin Centrepieces and Vignettes with you today. Thanks to Yvonne from Stone Gable for hosting this beautiful tour. 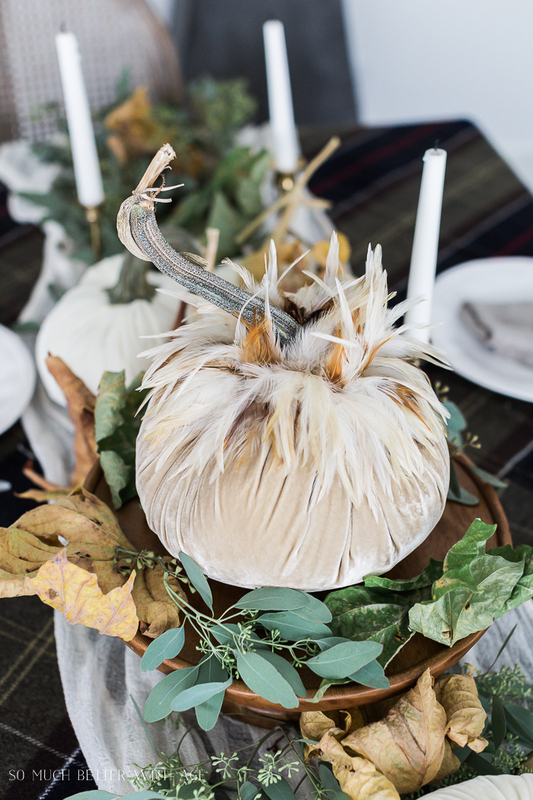 We have all received beautiful velvet pumpkins from LoveFeast Shop and we’re all sharing different ways of styling them and we have a giveaway for you! You could win a $200 gift card to LoveFeast Shop!! LoveFeast Shop is also offering a 15% off discount so be sure to read more below. 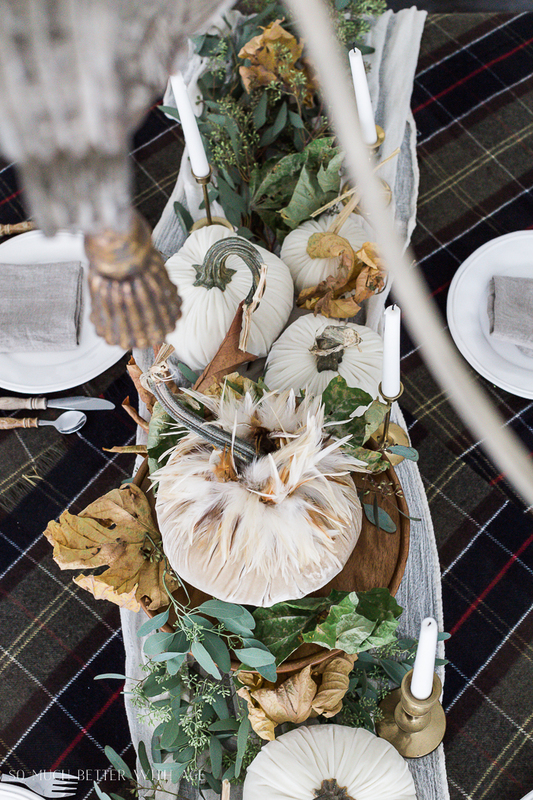 For my centrepiece, I couldn’t wait to use the plaid shawls that I just ordered and use them as a tablecloth. The velvet pumpkins showcase beautiful against them. 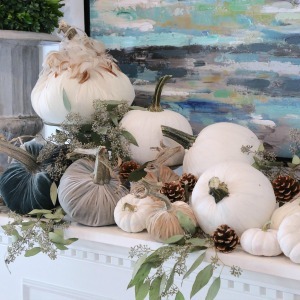 I’m so happy I ordered the snow coloured pumpkins because I have not seen any pumpkins in our stores currently and I love to buy the creamy-white ones. 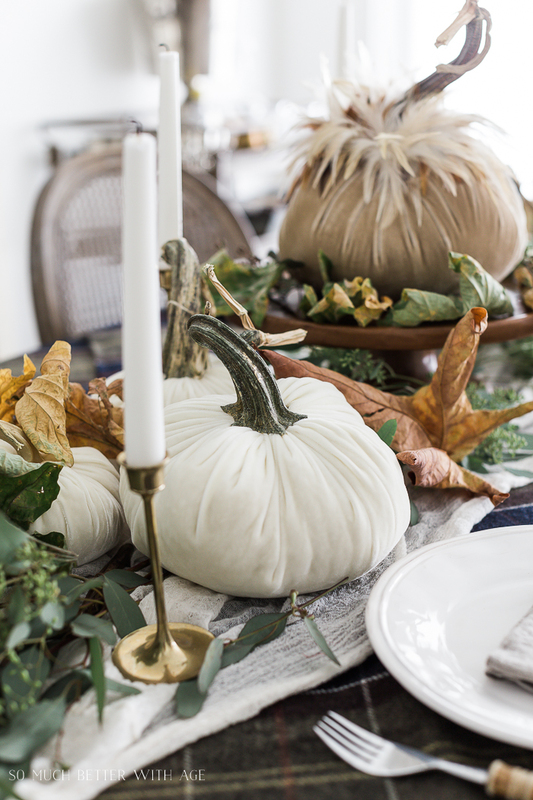 This table setting was so much fun to put together, I couldn’t wait to get started once I unpacked these velvet pumpkins. 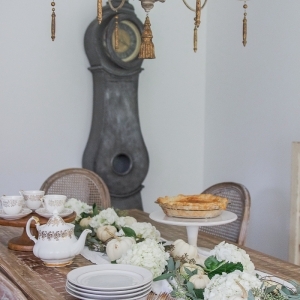 The rest of my centrepiece has seeded eucalyptus, fall leaves and as a runner, the cheesecloth tablecloth that was one of the projects I made for my book, French Vintage Decor. I hope you enjoyed this velvet pumpkin centrepiece. 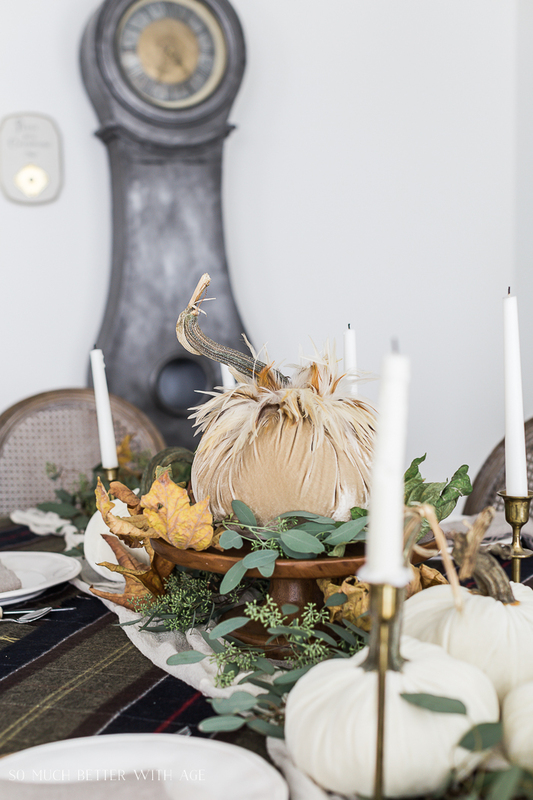 Be sure to visit my friends below to see how they’ve styled their velvet pumpkins. Be sure to enter the giveaway below for your chance to win a $200 gift card to LoveFeast Shop. 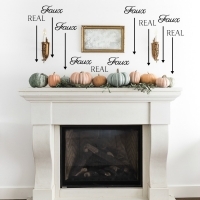 Disclosure: Thank you LoveFeast Shop for providing the velvet pumpkins decor. All opinions are 100% my own. So beautiful!! 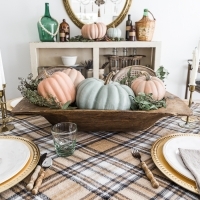 The colors of the leaves with the plaid and elegant pumpkins make for such a visually pleasing combination. You must smile every time you look at your table! Thanks so much, Mary Ann! 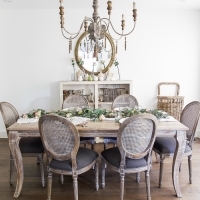 I loved style this table this year! I love the big beautiful pumpkin with the feathers in the center – but I fear my cat would love it more than me! 😀 I love it with the browns and greens! I love it too, Angelina. Yeah, I’m not sure it’s not cat friendly lol. Thanks so much, Cyndy! So great being on this tour with you. Thanks so much, Lory! I love the plaid with velvet too. Love the large real leaves, how they dried with curls and all! Your table is very special! Thanks Laurie. I love them too! Gorgeous! A pink one would look wonderful in my guest room which is always occupied at Thanksgiving. It’s mostly white with touches of pink and amber. I might have to buy one and sit it on a pedestal cake plate on the bureau. 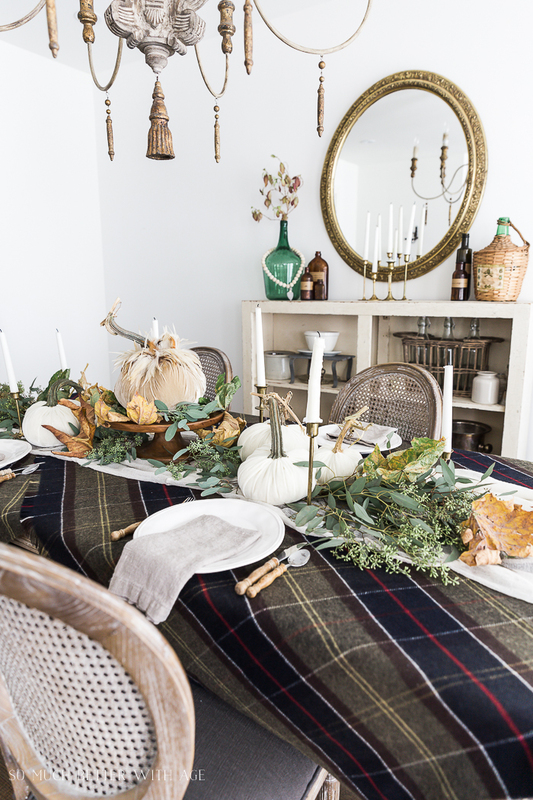 Using plaid shawls for your table is brilliant. Then if your guests get cold they wrap themselves in them. Lol I don’t have any big shawls or blanket scarfs but I do have a generous one that I can use as a runner. Off to dig in my winter container of scarfs & gloves. 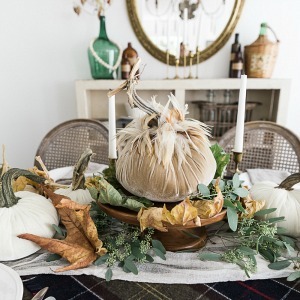 Oh, Jamie is it possible that you’ve outdone yourself this time with this elegant autumn tablescape!? My eyes tell me maybe SO! I have pored over every little creative detail you added to this masterpiece and I can get enough. 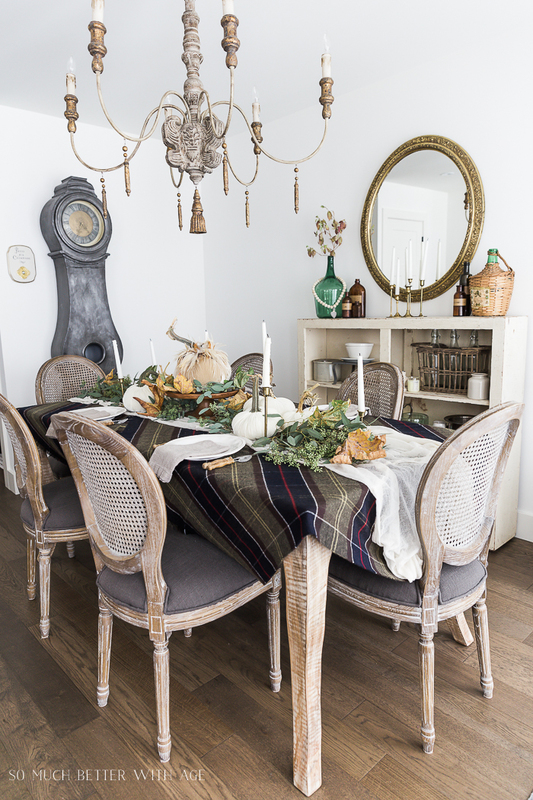 The gorgeous, textural plaid shawl is genius, the perfect canvas for your gorgeous neutral centerpiece. 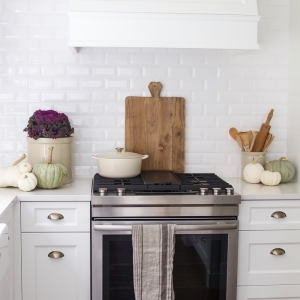 I love the use of neutrals for fall decorating as well as non-traditional colors. 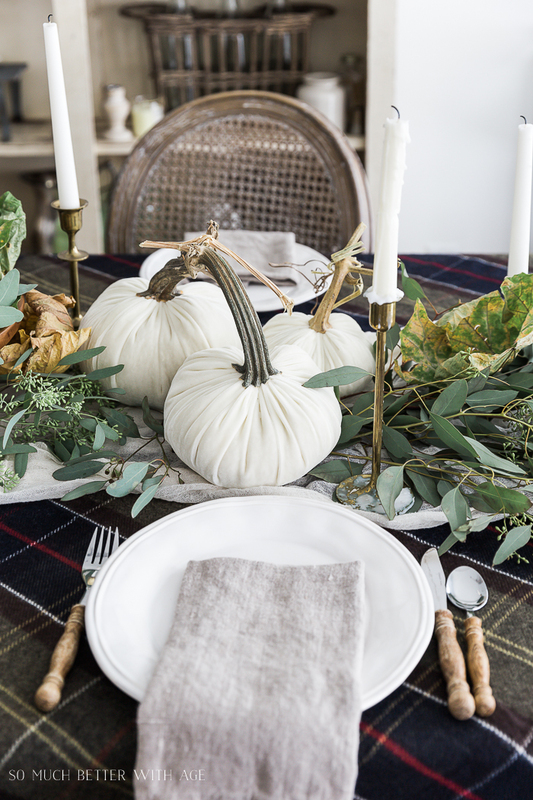 that beige velvet pumpkin adds so much flair to the wood bowl, greenery, leaves, and simple white candles. 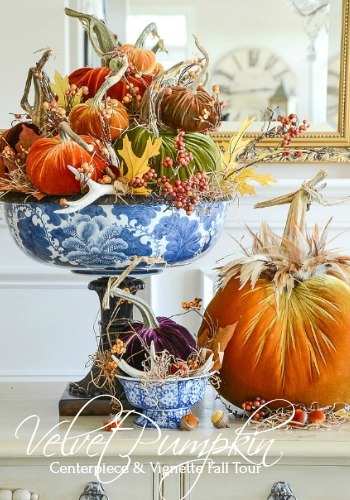 I have long loved your blog and inspiring creativity and your seasonal creations are always a treat. Thank you for sharing! Aww, Judy! I think that’s about the sweetest comment I’ve ever received! Thank you so much, I truly appreciate it. I had a lot of fun putting it together. Wow your table setting is absolutely amazing! 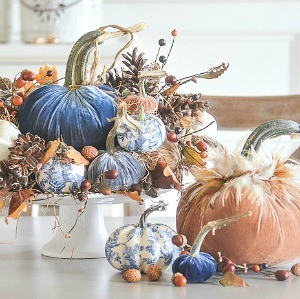 love the pumpkins with the feathers I have to have them. please enter me into the drawing. Love everything about this, Jamie! 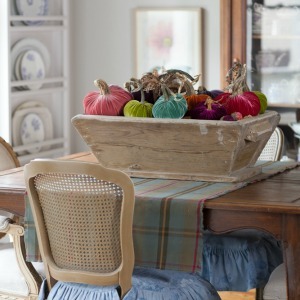 Gorgeous pumpkins and throw!